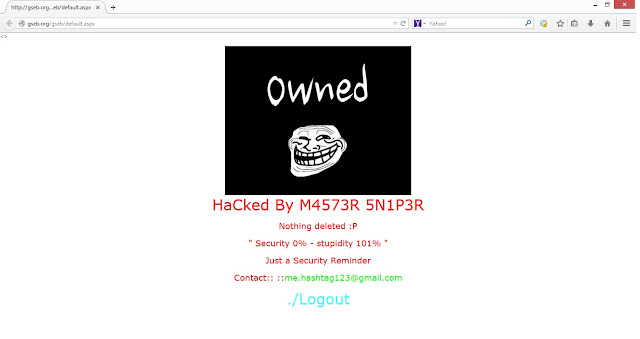 Gujarat Secondary Education Board (GSEB) official website www.gseb.org is hacked by anonymous hacker with nick name "M4573R 5N1P3R" and changed the home page of the website. GSEB 12th Results of 2016 are likely to be declared on the 17th May 2016 and website is hacked on 13 may in the evening. Authorities are worried about this bad incidence happened to the gseb.org website. GSEB is the official website of Gujarat Secondary and Higher Secondary education board. It is responsible to manage the various examination, recruitment and results in Gujarat state. Most of the news related to education in Gujarat are published on the same portal. It is also displaying the various madhyamik schools update on the website. All the GSEB Examination Results are displayed on the single platform called gseb.org.
" Security 0% - stupidity 101% "
Authorities, students and parents are really worried about the issue since there is a GSEB 12th Class Examination results 2016 is on next Monday, and GSEB website hacked yesterday. We hope that results are safe and not altered. Likewise GSEB 12th results were likely to be declare on 17th April but it may delayed due to this incidence. We are not sure about the changes in the date of exam results. It’s all depending upon the higher authorities. GSEB 10th results date 2016 is not declared yet but it will postponed for sure. The distribution of the original Gujarat 10th Admit Card 2017 slips must be completed at least 10 days before the exam date. Thankyou for providing the information i was waiting for this information from a long time. Good News, the Gujarat Board 12th class Result 2018 will declared on today at 9 am. Good news, the GSEB SSC Result 2018 has been declared on 28th May 2018. Candidates can check their GSEB SSC Result 2018 from the official website. GSEB 10th -12th Result 2018 will be going to announce soon on the official website at 28.05.2018. Applicants who are appear in GSEB Examination can download the Gujarat Board Result 2018 is here. For more details you can check the article below.